AT WORK ON THE BENGUELA RAILWAY, which runs through the Portuguese province of Angola, and links the Atlantic port of Lobito with the important copper mines of Katanga. This illustration shows natives fixing rails to steel sleepers. The gauge is 3 ft 6-in. IN the last few years many vital railway developments have taken place in the heart of Africa. Millions of pounds, mostly British pounds, have been spent in developing and building new railways in territory that is not always British. The uninitiated may ask the reason for this expenditure of cash and labour when most of the world is marking time, afraid of embarking upon any project which does not show a quick return of capital and profits. 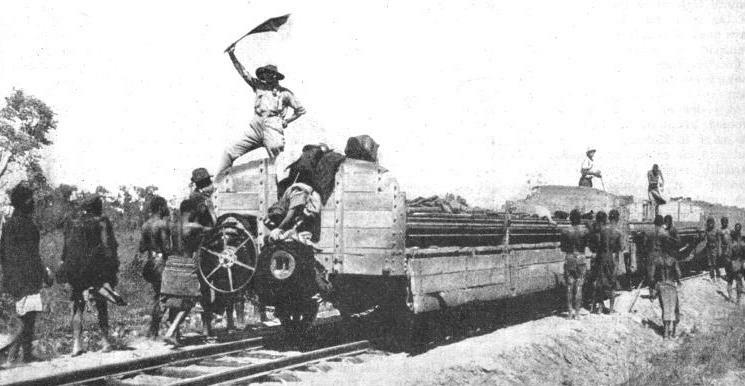 Engineers of various nationalities are surveying and building railways in South Central Africa, opening up highways of steel upon which the great mineral wealth of the continent will be brought to the ports and shipped to the workshops of the world. The reason for this enterprise can be put in one word - copper. This mineral has already altered the lines of communication in Africa and is the main reason for modern railway development in that great and still undeveloped continent. Cecil Rhodes’s dream of a Cape to Cairo Railway has not been realized, but the vast copper deposits of Katanga, a district on the Congo-Zambesi watershed, have been the loadstone which has drawn the railway lines on. They have extended northward from where they stopped at the time of Rhodes’s death, and also from the South Atlantic and the Indian Ocean shores of Africa. Pioneers of three nationalities, British, Belgian, and Portuguese, have played their parts in this modern drama of exploration, railway construction, finance, and politics. The drama has been staged in the steaming jungle, on the slopes of mountains, on the high veldt, in a palace with a king as one of the chief figures, in several parliaments, and in offices in cities of the Old and New Worlds. For the great industries of the world need copper, and the cheapest and only economic means of getting the copper from the Katanga deposits to the African ports is by rail; hence the railway developments in that part of the world. The great copper belt of Africa extends from the Katanga district of the Belgian Congo into Northern Rhodesia. The story of the development of the railways from Cape Town, to reach the copper belt, is told in the chapter “Progress in Rhodesia”, which begins on page 867. The present chapter deals with the making of an outlet to the Atlantic coast. For many years the Benguela Railway had linked Lobito Bay, the great natural harbour on the Atlantic coast of Angola (Portuguese West Africa), with the fertile plateau of that colony. In 1929 the railway was extended across a barren region aptly called the “Hungry Country” to the border of the Belgian Congo. In 1931 the Belgians extended their railways in the copper belt to link with the Benguela Railway at the border near the township of Dilolo, and the new route was opened. 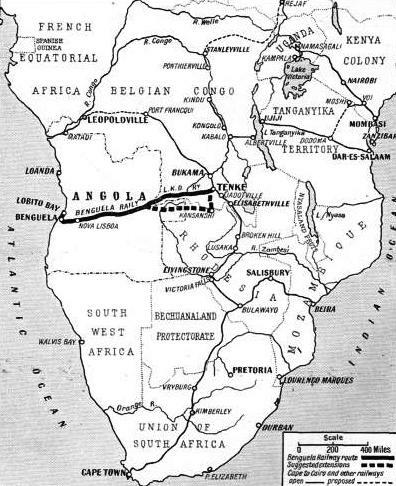 Thus it is now possible for the traveller from Europe to land from a liner at Lobito and to travel by train across Portuguese West Africa, cross the border into the copper belt of the Belgian Congo, and then cross the border into Northern Rhodesia at Sakania and travel to Bulawayo. Thence he can go by train either to the border of Portuguese East Africa and through that colony to the seaport of Beira, or south to Cape Town. The railways, whether in Portuguese, Belgian, or British territory on this route, are all on the standard South African gauge of 3 ft 6-in. The Benguela Railway, which has made this new Atlantic all-rail route possible, is due to British enterprise and capital, used in co-operation with the Portuguese, and owes its existence to the foresight and perseverance of a Briton, Sir Robert Williams, one of the makers of modern Africa. Angola, or Portuguese West Africa, is a big country. The estimated area is 487,800 square miles and the estimated population about 3,100,000. The colony is bounded on the north by the Belgian Congo, on the east by Belgian Congo and Rhodesia, on the south by the mandated territory of South West Africa, and on the west by the Atlantic. It has been Portuguese since 1575 except for a brief period of about seven years (1641-48), when it was in the hands of the Dutch. The Belgian Congo is much larger. The area is estimated at 918,000 square miles, with a native population of 9,384,000, the white population numbering 17,600 in January, 1934. To these figures must be added those for the two districts of Ruanda and Urundi, which were formerly in German East Africa but were mandated to Belgium after the war of 1914-18. This area is about 20,550 square miles, the population numbering 3,450,000 natives and about 900 Europeans. The coast-line is short, consisting of a narrow tract on the north bank of the Congo River where it enters the Atlantic between French Equatorial Africa and Angola. Except for this coastal wedge the west boundary is formed by French and Portuguese territory. On the north the boundary is formed by French Equatorial Africa and Anglo-Egyptian Sudan, on the east by Uganda. Tanganyika and Northern Rhodesia, and on the south by Northern Rhodesia and Angola. The Congo Free State, as the country was originally called, was founded in 1885 by King Leopold II of Belgium, who risked his private fortune and devoted his energy to its development. In 1908 the administration was handed over to the Belgian Government by the King. The vast copper deposits of Katanga are found at the south-east corner, where Belgian territory forms a salient in Rhodesian territory, some of the mines being in Northern Rhodesia. In the past copper was extracted by the natives and Arabs, but the early Portuguese and other adventurers were more interested in the quest tor gold. In the last century the existence of the copper was mentioned by several explorers, and towards the end of the century definite search was made in the hope of locating it. In 1895 Sir Robert Williams sent an expedition in search of mineral wealth into Central Africa, but without result. In 1899 another expedition, from the railhead at Bulawayo, discovered the potential riches of Katanga. This discovery, followed by the opening up of the mines, affected the whole direction of the railways that were then in their infancy. Sir Robert Williams considered that the most direct and cheapest way of transporting the copper was to build a railway from Lobito Bay on the west coast. At that time, however, the railway development from Beira, the port on the east coast, was advanced and was extended well into Rhodesia. New lines were added enabling this track to reach the copper belt, and the way to the Indian Ocean was open. Despite this, Sir Robert did not abandon his idea of a railway from the copper belt to the Atlantic, and he obtained a concession from the Portuguese Government. In 1904 work was started on the Benguela Railway. Meanwhile, the Belgians were developing railways in the copper belt and also along the Congo. That great river should be the natural outlet, but, unfortunately, long stretches are impeded by rapids. This circum-stance is the reason for railway development, as, but for these rapids, the labour and expense of building lines would not have been incurred. 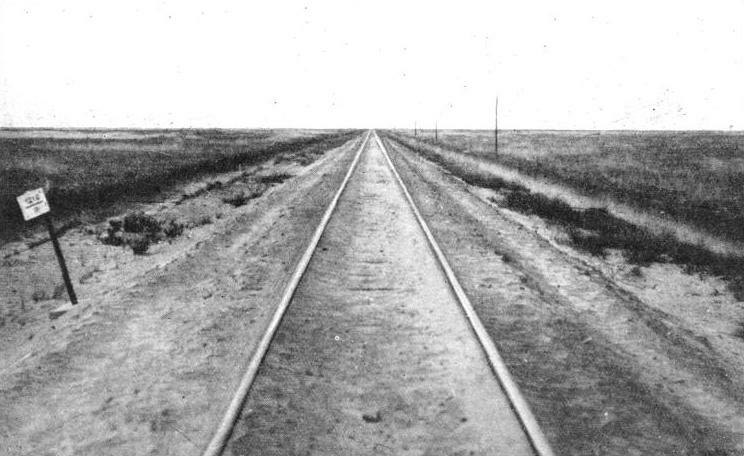 OVER 3,000 MILES of sea and rail transport were avoided by the building of the Benguela Railway. Copper mined near Tenke has an alternative outlet at the port of Lobito, in addition to Beira, for shipment to Europe. The Benguela Railway also enables a journey to be made across Africa or south to the Cape. The railway builder on the Atlantic side of this part of Africa has a big problem to face. On the east coast the problem of climbing up several thousand feet to the high plateau is bad enough, but on the west coast it is rather worse, because the preliminary ascents are in more broken country. Fortunately the railway builders on the Angola side of the continent had the advantage of a splendid natural harbour, which provided deep water and safe anchor-age, and was much nearer to the ports of Western Europe than was Beira. Lobito, the starting-point of the railway, is said to be the finest natural harbour in Africa. The sand spit which shelters it from the sea shelves steeply, and large ships can moor within thirty feet of it. On this spit, which is about 200 yards wide, have been built the offices of the railway company, Government offices, and the homes of officials. The white population of the port numbers about 1,000, of whom a quarter are children. The climate is healthy. The railway pier has berths affording a depth of water of fifty feet. Ships of all nationalities call at the port. The first section of the line was easy to build, and was laid along the shore towards Benguela, past the industrial and agricultural town of Catumbela, eight miles from Lobito. The line is taken across the River Catumbela by a bridge. Water from. this river is supplied to Lobito by two pumping plants, one belonging to the Government and the other to the railway; and there is an electrical power station which supplies power to Lobito and Benguela and to the sugar factories. There are sugar plantations, salt pans, stone quarries, and lime kilns in this thriving area. Benguela, twenty-two miles from Lobito, is the capital of the district from which the railway takes its name, and is the administrative centre, with shops, hotels and a theatre. The line now leaves the coast and turns inland, and soon begins to climb. Benguela is a mere 23 ft above sea-level, but Lengue, thirty-one miles, lies at an altitude of 318 ft. In the two and a half miles between Lengue and the next station, San Pedro, the gradient rises at 1 in 16 to overcome a climb of 456 ft. This stretch is laid on the Riggenbach rack principle, and the company owns four rack locomotives, which are used to haul the trains. The Lengue Gorge, out of which the line has to climb, was a big problem for the engineers. This section from Benguela over the first of the mountain barriers to Catengue (1,762 ft), seventy-six miles from Lobito, took some four years to build. Every drop of water had to be brought from the coast by carriers, camels, and ox-wagons. Even at Catengue the water was unreliable, and a good water supply was unobtainable until Caimbambo (101 miles, 2,424 ft) was reached. At first construction was hampered by lack of labour, but after a time Senegalese from West Africa and Indian coolies from Natal were hired. Heavy adverse gradients up to 1 in 50 are a feature of the line all the way to Nova Lisboa, 265 miles, altitude 5,571 ft. The summit-level, 6,082 ft, is at Calenga, 239 miles from Lobito. The rails weigh only 60 lb per yard. “Garratt” locomotives are used to haul the trains over this difficult line. As the line climbs it passes through maize, fruit, and coffee plantations. Ganda (157 miles, 4,200 ft) is a thriving little township with about 225 European inhabitants. The native population in this rich agricultural district is large. A good road goes south from the railway across the mountains to Kakonda. 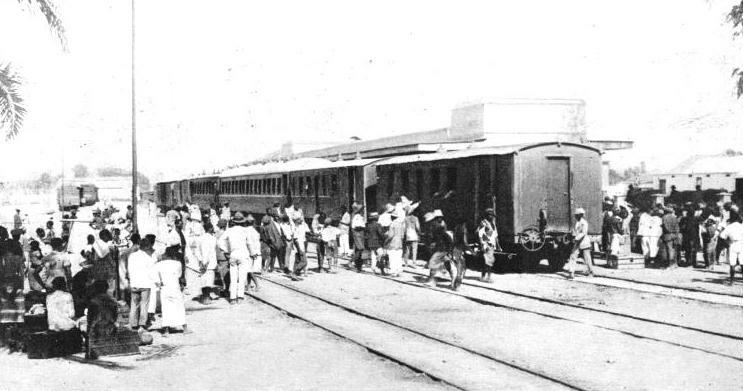 THE ARRIVAL OF THE MAIL TRAIN at the town of Benguela. Although the Benguela Railway is a Portuguese company, it was built by British enterprise, and some £12,000,000 were invested in it. The line owns about 70 locomotives, 40 carriages, 590 wagons, and seven rail motors. There are large sisal plantations at Alto Catumbela, 167 miles from Lobito and 4,003 ft above the sea. Lepi (228 miles, 5,370 ft), lies on the high slopes of the Lepi range, which afford magnificent scenery. With its fine situation and healthy climate this place is expected to be developed as a health resort. The water is the best in the new country opened up by the railway, and is sent to various places along the line. Calenga, at the summit of the railway, is another place suitable for European settlers. It is a progressive settlement and a centre for growing potatoes and fruit. Vila Robert Williams (246½ miles), the name of which is a tribute to the inspirer of the railway, is another prosperous settlement on the high plateau. It has two hotels and a number of commercial buildings. The next station is Nova Lisboa (265 miles, 5,571 ft), the centre and administrative headquarters for the hinterland of Angola. Here are situated the main repair shops of the railway. Power is supplied from a hydro-electric plant on the River Cuando, about twelve miles away. There are many commercial firms, factories, flour mills, saw mills, tanneries, and workshops in the town, which is the focal point of a system of good roads. After leaving Nova Lisboa the gradient of the railway eases to 1 in 80, as the line proceeds through undulating high veldt country. Vila Nova (298 miles, 6,063 ft) is a flourishing settlement. Chinguar (322 miles, 5,932 ft) was the town reached by the railway in 1914, and the point where it stopped for some years during the war of 1914-18. This place is a centre for maize, hides, oil-seeds, and wax. After the end of the war progress was slow for a number of years, and by 1923 the line had crept forward less than seventy miles, to reach Silva Porto, 390 miles from Lobito and 5,643 ft above the sea. The town is the centre for the fertile, well-watered Bié District, and has good roads, flour mills, tile and brick factories, and cattle ranches. In 1924 the work of carrying the railway to the border began again in earnest, and from then until August, 1928, when the Luao River, the boundary, 837 miles from Lobito, was gained, the work was continuous. The opening ceremony was performed on June 10, 1929, by the Portuguese Colonial Minister, who was knighted by King George. Vila General Machado (436 miles, 4,836 ft) was named after the late General Sir Joaquim José Machado, a distinguished governor of various Portuguese Colonies. At Cuanza (450 miles, 4,170 ft) the Cuanza River is crossed by a combined road and railway bridge of four 131-ft spans. The construction of the line from Nova Lisboa, 185 miles, to this point is light. The line proceeds, across many bridges, through the swampy valley of the Cuiva River. Cuemba (487 miles, 4,363 ft) is a station near the beautiful Cuemba Falls and serves a large sisal-, coffee-, and tobacco-growing area. The falls, which are 200 yards wide and have a sheer drop of 150 ft, are employed to generate electricity for the plantations. Emerging from this cultivated fertile belt the line has to cross a remarkable stretch of country, known as the “Hungry Country”, for about 250 miles. This is sandy bush land, which is well watered, but does not produce food. In the old days traders and Arab slave dealers traversed this country on their way from the interior to the coast. The native carriers hated the place. Enough food had to be carried to get across it, and if this amount was cut down to increase the load of goods, as it often was, the carriers perished from hunger and exhaustion in large numbers. In addition, the caravans were harried by raiders, until the Portuguese sent an expedition which stopped the raids. But the exhaustion and difficulties of this route remained until the railway was built. THE RUSH HOUR IN AFRICA. The above photograph shows a crowded platform at Benguela Station. There is a busy suburban traffic between Benguela and Lobito, and the district served is a thriving one. In 1933 the operating receipts of the line amounted to £240,000. The builders could not find any stone, and the sand was unsuitable for their requirements, so that all the material had to be brought up by construction trains. The Zambesi-Congo watershed lies between Kilometre 860 (534 miles) and Kilometre 880 (547 miles), at an altitude of 4,800 ft. This remarkable region is so narrow that the sources of streams are sometimes only a few hundred yards apart, yet the waters flow on either side of the divide to the two great rivers, so the water from almost the same spot ultimately flows into the Atlantic or into the Indian Ocean, the respective outlets being thousands of miles apart. Stations are now at close intervals along the line to the border. The most important is Vila Luso (643 miles, 4,357 ft), where Government buildings, including a wireless station and a hospital, have been erected. The last station before the border, Teixeira de Sousa (820 miles, 3,602 ft) is named after the Portuguese statesman who signed the concession agreement for the railway. The international bridge across the Luao River is crossed at Kilometre 1,347 (837 miles), and Dilolo Station, in Belgian territory, is nearly two miles farther on. The completion of the Benguela Railway is commemorated by a granite boulder which was brought 800 miles to be placed on the concrete abutment of the bridge on the Angola side of the river. On a brass plate are inscribed in Portuguese the outstanding dates, the last one being June 10, 1929, when the inauguration ceremony took place. Sir Robert Williams attended the opening. At that time, however, the through route from Elisabethville to the Atlantic was not complete, as the Belgians had not finished the extension of their railways from the copper belt. 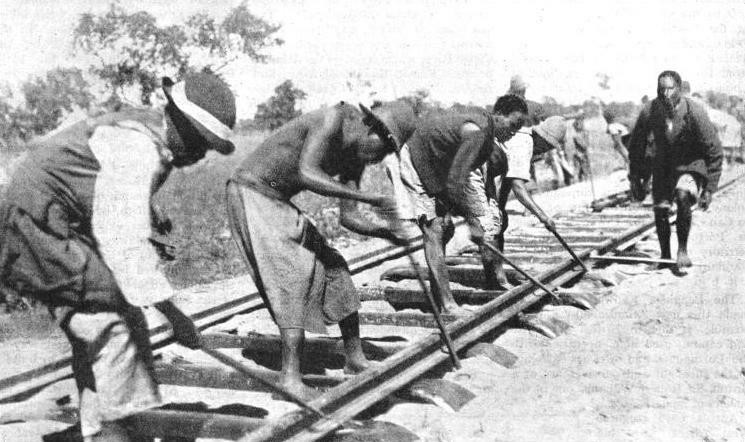 Work proceeded at a steady pace, and on July 1, 1931, the opening ceremony of the through route from Elisabethville to Lobito was held at Dilolo Station. A special train of the Benguela Railway steamed across the bridge from Angola, and stopped at the platform at Dilolo Station, where the train from Elisabethville had arrived, and the Belgian, Portuguese, and British officials celebrated the occasion, which meant that a railway link across the continent of Africa had been forged. As stated above, the distance from Lobito to the bridge on the border is 837 miles. The distance from the bridge to the important railway junction at Tenke in the Belgian Congo is 324 miles, bringing the mileage from Lobito up to 1,161. Elisabethville, the capital of the Province of Katanga, which is on this Leopoldville-Katanga-Dilolo Railway, is 1,312 miles from Lobito. The line to Bulawayo, the Rhodesian junction from Beira and Cape Town, leaves the Belgian Congo at Sakania. Considering the important junction of Tenke, which will be referred to later, as the hub of communications, the distances by railway are: Lobito, 1,161 miles; Beira, 1,777 miles; Cape Town, 2,464 miles. The saving in mileage from Tenke to South-ampton by the new railway and the sea is great, the distances being: via Lobito, 6,050 miles; via Beira, 9,350 miles; via Cape Town, 8,450 miles. Expresses are timed to leave Lobito and Elisabethville every week, and the journey of 1,312 miles takes about three days. The Benguela Railway owns seventy-six locomotives, seven rail-motors, forty-seven carriages, eighteen guards’ vans, and 591 wagons. About £12,000,000 of British capital have been invested in it. First- and second-class corridor coaches with sleeping and restaurant cars are attached to all through mail trains. Through trains have been run from Lourenco Marques (Delagoa Bay), the capital of Portuguese East Africa, to Lobito, a distance of 3,500 miles, in about eight days. One of the reasons for the delay in continuing the line from the plateau across the “Hungry Country” to the Belgian border was the fact that it was thought that a new line would affect the earnings of the British-owned lines over which the copper was being hauled to the port of Beira. The Belgians, however, were busy extending their own lines towards the Atlantic. The Benguela route is the first all-rail route to be completed to the Atlantic. A CONSTRUCTION TRAIN with its load of rails and other material being moved on over a completed section of the Bengueta Railway. A scarcity of water and of native labour hindered the building operations ; one section of fifty-four miles, from Benguela to Catengue, took four years to finish, all water having to be brought by carriers, camels, or oxen from the coast. The difficulties of the Belgians in opening up a line of communication by way of the Congo have been great. The natural highway of the country should be the river, but the various rapids have made a complete system of water transport impossible. Coming from the sea to enter the country by this great river, travellers soon experience difficulties. Ocean-going vessels drawing 18 ft of water can proceed about a hundred miles up the river to Matadi, but progress by water to the capital at Leopoldville is barred by rapids. Matadi, at an elevation of 88 ft, lies under the edge of the great escarpment known as the Palabala, which is, of course, responsible for the rapids that stop navigation of the river. Therefore the first railway to be built in the colony was a narrow-gauge line from Matadi to Leopoldville, a distance of about 250 miles, which took about eight years to build, and was one of the most difficult pieces of engineering in Africa. It required ninety-nine bridges and 1,250 aqueducts. A similar escarpment on the other side of the Atlantic in the province of São Paulo, Brazil, puzzled engineers until a young Briton found a way up by hauling trains on steel cables, as described in the chapter, “A Gateway to Brazil”, on page 515. Some scientists hold a theory that South America at one time was joined to Africa, but shifted west, and they point out that the coast line of South America would almost fit that of Africa by pushing Brazil into the great bight of the West African coast. Conditions in the Congo were similar: the rock was treacherous, the rainfall was torrential at times, and the cliff had to be surmounted. In the ‘eighties a British syndicate approached King Leopold with a plan to build a line; but, although he was interested, the Belgian people preferred that their own engineers should make the attempt. A young officer, who afterwards became General Albert Thys, submitted plans which the King approved. Capital was raised, and work began in March, 1890, with a labour force of 800 natives recruited from such widely-separated parts of Africa as Zanzibar, Senegal, and Sierra Leone. The gauge decided upon was 2 ft 3½-in, and the railway was not to be helped up by a cable or a rack-rail. The line had to be taken up from an altitude of 88 ft to one of 995 ft, in slightly less than the first ten miles, 722 ft of this having to be climbed in less than four miles. After that, further difficulties in the way of mountain-climbing were in waiting; but the Belgians had enough to harass them from the start. Their mixed gangs could be taught to use picks while they were being supervised, but that was about the limit of their trustworthiness. The heat and conditions at this low level soon took its customary toll of white men in the tropics. With picks alone, working on hard rock progress was necessarily slow, so that two years elapsed before a section of five and a half miles was completed. Such a big hole had been eaten into the original estimate of £1,000,000 for the entire line - £2,400,000 was ultimately spent - that the Belgians at home were as dismayed as most of those in the Congo. At one time there were only about two optimists, Thys and the King. To give up this first Belgian attempt at building a railway in a tropical colony would have been a blow to national pride. Purse-strings were therefore loosened, the labour force was more than doubled, and the work went on. The rock was quartzite, and time and again, after a ledge had been cut in the cliffs to hold the track, the rock from above came down and obliterated the ledge. Fissures had to be crossed by bridges or viaducts, and it was not until early in 1893 that the first eight miles were completed. The next fifteen miles to Kenge were built in ten months, the natives and the engineers learning by experience as they went on. The summit of the line was reached at a height of 2,437 ft, and was named Thysville. This place is about 143 miles from Matadi, and has since become a residential town and the headquarters of the railway staff, because of its healthy altitude. Before this point was reached there were many troubles, such as a rock-slide caused by rain, which demolished five miles of track just after it had been built. Leopoldville, 951 ft above the sea, was reached in March, 1898, and the line was opened about three months later. A REMARKABLE “STRAIGHT” of the Benguela line near Vila Luso, 643 miles from Lobito. The rails weigh 60 lb per yard, and “Garratt” locomotives are used over difficult stretches. The summit-level of the line is at Calenga, 6,082 ft above sea-level, and 239 miles from Lobito. Because of the broken nature of the high ground the gradient profile of the line resembled a badly cut saw, with gradients as steep as 1 in 22. The Belgian pioneers had done their best in heart-breaking circumstances, and their work remained as it was until a few years ago, when the track was improved and the gauge altered to that of 3 ft 6-in. The ruling gradient has been improved to 1 in 59. Above Leopoldville the Congo is navigable to Stanleyville, where the barrier of the famous Stanley Falls stops the river steamers. To avoid the falls a railway seventy-eight miles long was built to Ponthierville. It was begun in 1903 and completed in 1906. Above Stanleyville the Congo River is called the Lualaba. The river is navigable from Kongolo for 397 miles as far as Bukama, which town was, until 1923, at the end of the railways which were reaching out westward from the Katanga copper belt. As can be judged from the foregoing, the task of taking goods from Bukama to the ocean port of Matadi involved frequent changing from river to railway. It did, on the other hand, satisfy those who wished their produce to reach Belgium by an all-Belgian route. 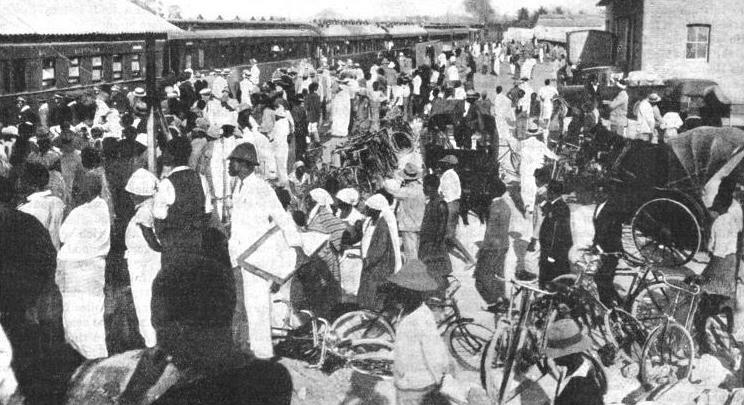 This desire prompted the Belgians, after the railways in the copper belt had established contact with those of Rhodesia, to push the 3 ft 6-in gauge lines north-west from Elisabethville to Tenke and then north to Bukama, which town was reached in May, 1918, despite the interruption of the war. The distance from Sakania, on the Rhodesian border, to Bukama is 535 miles. When this railway was completed the Belgians had a route, mixed though it was, to the sea independent of the railways and territories of Great Britain and Portugal. The Belgian engineers next turned their attention to avoiding the great detour caused by the complication of the route. This could be short-circuited by driving a line, 698 miles long, from Bukama to Port Francqui, and also by building a line from Tenke to Dilolo, 324 miles long, to link with the projected extension of the Benguela Railway, which was then built as far as the border of the “Hungry Country”. The Compagnie du Chemin de Fer du Bas Congo an Katanga (Railway Company from the Lower Congo to the Katanga), which is responsible for the line from Sakania to Bukama, built both these lines. It also had in view the further idea of building a line from Port Francqui, the native name of which is Ilebo, to Leopoldville. Although this section is not built at the time of writing, it is being surveyed. The building of the line from Bukama to Port Francqui in itsell saved a considerable mileage, as Port Francqui lies at the confluence of the Sunkuru with the Kasai Rivers. The Kasai flows into the Congo at Leopoldville. The importance of the railway from Bukama to Port Francqui is emphasized by the fact that the late King Albert opened the railway in July, 1928, the line having been begun in 1923. Produce is now taken by rail from Katanga to Port Francqui, put aboard river steamers and taken down to Kasai River to Leopoldville, where it is again hauled by rail to Matadi and shipped direct to Europe. THE OFFICIAL OPENING CEREMONY of the Benguela Railway took place in 1931, when a special train - seen above - was run over the route. The line, stretching east from the Atlantic Ocean for over 830 miles, took twenty-eight years to build. At present even this route is long compared with that provided by the Benguela Railway line to Lobito. The journey by train from Elisabethville to Port Francqui, 990 miles, occupies three days, while the river steamer takes eight more days to reach Leopoldville. After this another day is taken up by the train journey to Matadi, which port is eighteen days’ journey by mail steamer to Antwerp. At the moment, therefore, the Benguela Railway route is more expeditious, but how long it will remain so is a matter of opinion, so great is railway competition and enterprise in the heart of Africa. The railway between Bukama and Port Francqui was built in quick time at a low cost. Bukama is 285 miles from Elisabeth-ville, 1,232 miles from Bulawayo, and 2,598 miles, or six days. from Cape Town. Once a week trains reach it from Elisabethville. If and when the projected railway is taken from Port Francqui to Leopoldville there will be a second 3 ft 6-in gauge line leading to the Atlantic. 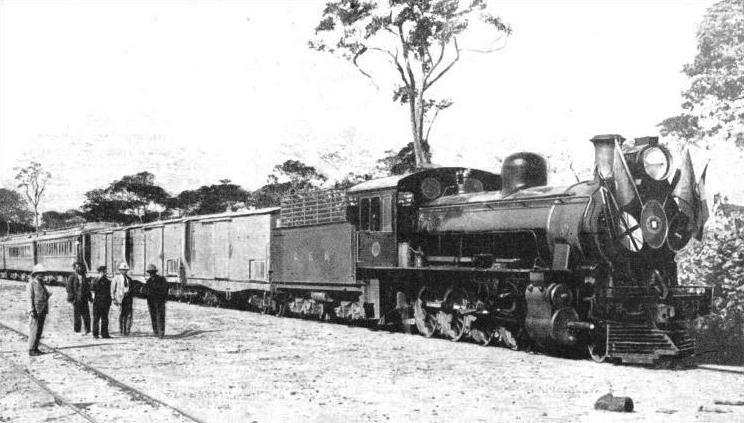 The Tanganyika Government Railways, which, as stated above, are linked with the Belgian Congo by steamers which ply across Lake Tanganyika, is able to offer another way to the sea from the heart of Africa. This metre-gauge system reaches the Indian Ocean at the port of Dar-es-Salaam, and the mail trains have corridor coaches and dining-cars. The railways operate two steamers on Lake Tanganyika to link Kigoma, in British territory, with Albertville, in the Belgian Congo. One of these vessels is 232 ft long, with a beam of 32 ft. By this route it is possible to travel from Elisabethville to Dar-es-Salaam in eight days. North of Lake Tanganyika lies Lake Kiva, which is 4,820 ft above the sea, and is considered to be the most beautiful lake in Africa. The shores are healthy and fertile. This lake swarms with fish and there are no crocodiles. To the east is the densely populated area of Ruanda. A good road connects the two lakes. New lines projected in the Congo include a scheme for building a railway from Stanleyville to the Kilo-Moto goldfields in the north-east, and for eventually continuing as far as the River Nile. The main line has been surveyed, and it is proposed to construct a branch to establish communication with the Sudan. Although the main railways in this recently developed part of the world are linked, it is not possible to consider them as a whole, because of the differences in nationality, ownership, and operation. As we have seen, the pioneers began at the coasts in places thousands of miles apart with different climates, with different objectives, and with different nationalities. The whole course of events has been changed by the development of the copper deposits. These changes have occurred within the lifetime of a middle-aged man and are still going on. Until the coming of this railway the interior of the continent was undeveloped, although the coastal fringes were long known. As far back as somewhere about 600 BC the Egyptians sent out a fleet manned by Phoenicians, which sailed from the Red Sea, went right round Africa and returned to Egypt by way of the Straits of Gibraltar. Hanno the Navigator, a Carthaginian, sailed far south along the west coast. Modern history begins with the Portuguese navigators, sent out in the first place by Prince Henry the Navigator (born 1394, died 1460). These adventurers explored the coast, each man going farther than the last. Many years later the explorer Bartholomew Diaz was blown far south of the Cape of Good Hope and fought his way north and east to beyond Algoa Bay. These men were looking for two things, the land of Prester John, a great king they thought lived in Abyssinia, and the way to India and the Far East. In November, 1498, Vasco da Gama rounded the Cape of Good Hope on his way to India. From this time onwards comparatively little could be done to open the heart of Africa. For practically four hundred years transport away from the coast was as difficult as it always had been. Men such as Dr. Livingstone endured great hardships and earned undying fame by reaching places - and that less than a century ago - which are now tourist resorts in this wonderful country. Within a period of a few years it has been made possible for a tourist to walk into an office in London and book a steamship passage and a railway journey into the heart of Africa, and to arrive without missing a meal or a night’s sleep. At the same time, the traveller passes in comfort through country which not long ago was so obstructed by nature and man that the conquest of every mile was an achievement. No railway romance of the past can eclipse in interest the fact that in these days of high-speed traffic the transport problems of Central Africa are being fought out by means of steam-operated railways. These have succeeded in highly competitive days against the oldest form of transport - a man carrying a load, the newer method of motor transport by road, and the even newer method of transport by air. PIONEERS OF THREE NATIONS - British, Belgian and Portuguese - have been responsible for the railway in West and Central Africa. In 1931, when the Benguela Railway was complete, the Belgians extended their line from the important junction of Tenke to meet it near Dilolo. International co-operation has made possible transcontinental travel in Africa. You can read more on “Developments in South Africa”, “Pioneering in Nyasaland” and “Progress in Rhodesia” in Railway Wonders of the World.